Stress field of the connecting rod under pressure load. 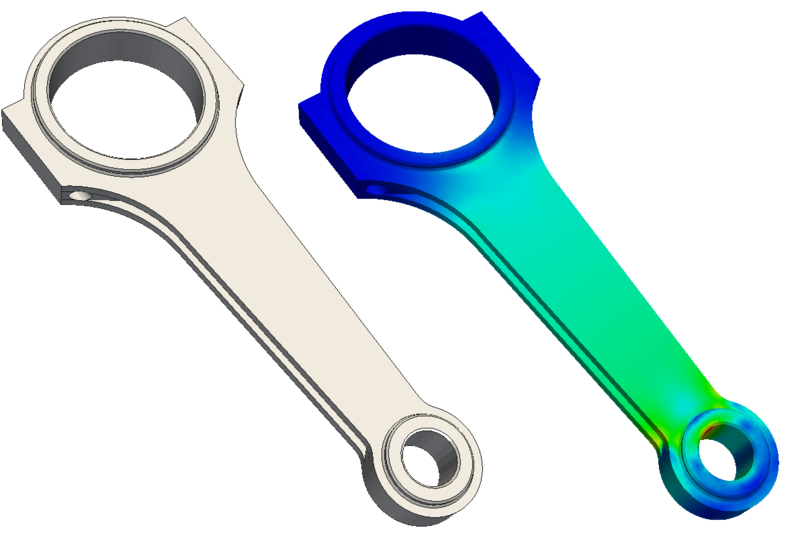 In this tutorial we will conduct a structural analysis of a connecting rod. Doing this, we like to show you how to set up a simulation run and produce results in a very short period of time. To start this tutorial, you have to import the tutorial project “Tutorial-01: Connecting rod stress analysis” into your ‘Dashboard’ via the link above. Click on the “+” button to create a New Simulation. In our case, we are interested in running a static stress analysis, so we choose Static. Next you will see a cutting plane which you can adjust under Mesh Clip parameters. For example, in this case give Normal (y) a value of -1 in order to clip the mesh from the middle of the geometry. Click Preview button to see the cutting plane. The black arrow shows the direction of clipping. Figure below elaborate the steps. Click the Generate Mesh Clip button to start mesh clip. Clipping might take few minutes depending upon the geometry to complete. Figure below shows the clipped mesh. The next tree item Boundary conditions is the place where we can define constraints as well as loads acting on the connecting rod. A fixed support at the top end of the connecting rod. For example, to check the von Mises stress on our model, click on the Results and then select the von Mises stress fron the Scalar list below. A list of all the available filters can be seen on the left side. Congratulations! You just completed a complete static stress simulation using the SimScale!